I follow a #WorldGEOchat Twitter group that meets every Tuesday evening and am constantly finding new ideas for teaching and for engaging people with social issues that have roots in the past, but are cause for great concern in the present and the future. 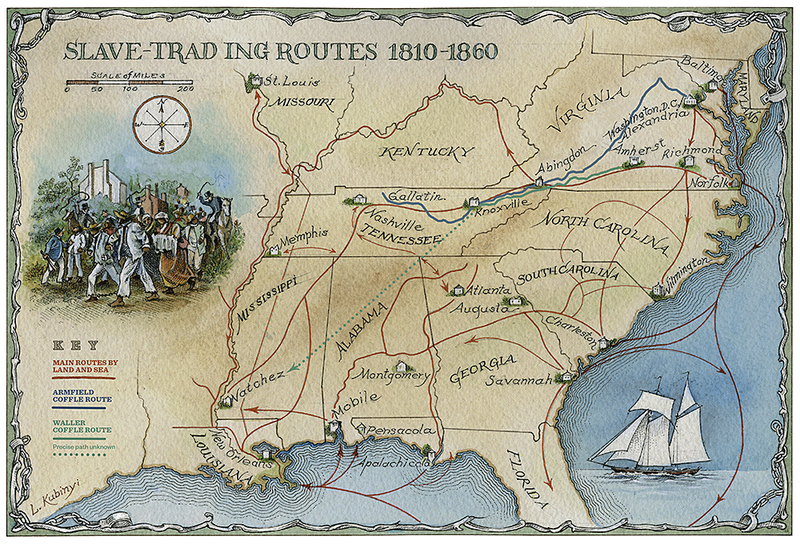 Last week I saw a mention of using ESRI story maps to teach the history of the nineteenth-century US slave trade. I clicked the link and started reading an article titled "Teaching Nineteenth-Century Slave Narratives: Engaging Student Scholars in the Production of Digital Story Maps" written by Amy Lewis, Assistant Professor of Humanities and Liberal Arts, St. Norbert College. The article is an important read because it encourages student study of the American slave trade, which I feel is and important journey for many to take. It also shows how the students used ESRI story maps to plot escape routes and show movement of individual slaves while in captivity. The author says "the digital story maps engage their interest in ways that few other assignments can match and that they create an awareness of how digital media impacts the ongoing conversation about nineteenth-century slavery that continues to unfold in the United States." I wanted to share this article, but it did not have usable images so I did a Google search for "slave trade ESRI story maps" then looked at the images. The one I used in this article is from a site titled "The Slave Trail" which is an extensive resource. This link opens the ESRI story map on that site. Thus, by opening one link, reading the article, then doing a search for more information, I'm expanding my own learning. By writing this article, I'm hoping to spark the curiosity of others. I go one step further. I put links to some of these articles in the Tutor/Mentor web library, to help people find some of the articles I've found valuable. It looks like many colleges are using story maps and teaching digital literacy. If you're an educator, or someone interested in history, or in reversing the centuries of injustice caused by slavery, these resources will be useful to you. 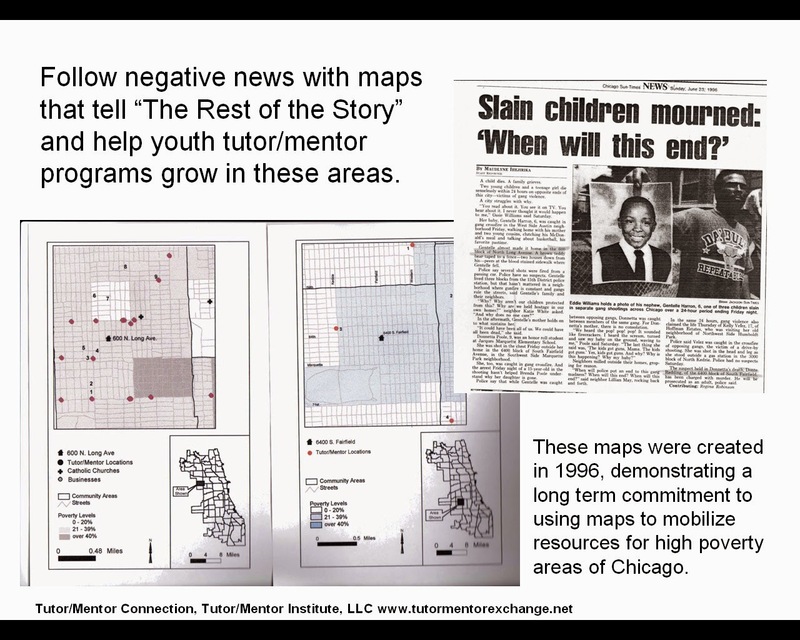 However, I'm hoping that some of the students and faculty who learn to use GIS mapping to tell stories will look at what I've been trying to do for 25 years to use stories and maps to support the growth of volunteer-based tutor, mentor and learning programs in areas of high poverty, frequent violence, poorly performing schools and many other indicators that can be viewed on a map. I don't just want to build a deeper, more empathetic understanding. I want to influence more people to take the YOU role in this graphic. Become someone who helps mobilize time, talent and dollars from people YOU know, to support the growth and continued operations of mentor-rich programs in more places. 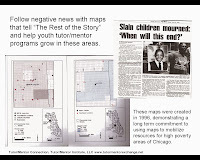 I maintain a list of nearly 200 organizations in the Chicago region that offer various forms of tutoring and/or mentoring and plot locations on maps to help build an understanding of where programs are located and where more are needed...and to help parents, volunteers and donors connect with individual programs. This could be duplicated in other cities, with students from high schools and/or colleges building and maintaining the list of programs, and duplicating work I've been doing to use maps to draw attention to the data resources. If this interests you, introduce yourself in the comment sections, or connect with me on Twitter @tutormentorteam or on Facebook, or LinkedIN.